Ball Thrown Back Into Obama’s and the Arabs’ Court……. – The Tundra Tabloids……. Ball Thrown Back Into Obama’s and the Arabs’ Court……. Like the TT said, Israel will not be the spoiler here. Show who and what the real obstacles to peace are, and keep shining a light on them. 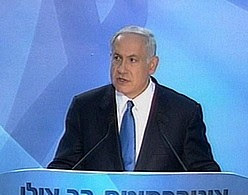 Netanyahu said that he embraced President Barack Obama’s vision, adding, however, that the Holocaust was not the reason for the establishment of the Jewish state. The prime minister said that the descendants of the Palestinian refugees must not be resettled within Israel borders and that Jerusalem must remain united. Israel, he said, would not build any new settlements or expropriate new land for existing settlements. UPDATE: This is why it’s wise for Israel to state the obvious in an upfront, but non-confrontational way. The Arabs that call themselves Palestinians (ATCTP), whether they are Hamas or Fattah, cannot accept a Jewish state. The denial of a Jewish state and the vow for its destruction, is at the heart of the conflict….not settlements. Read the words which actually reflect the mindset of the Arabs, Israel’s insistence that they recognizes its Jewish character prompts the most bizarre, but true reflections of how these religious supremacists think. Previous Post Previous Post Fuzzy Headed Half of Dutch Society Divided Over Geert Wilders……. Next Post Next Post Netanyahu Speech Draws Praise and Criticism…….